Caused by: Gaeumannomyces graminis (Sacc.) Arx & D. Olivier var. avenae (E. M. Turner) Dennis. 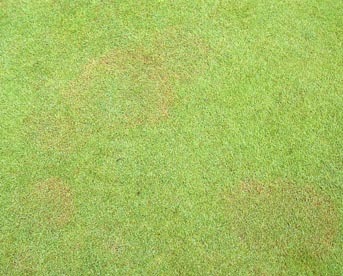 Take-all patch symptoms begin as a slight reddening or bronzing of bentgrass usually in a ring during summer months (Plate 1). 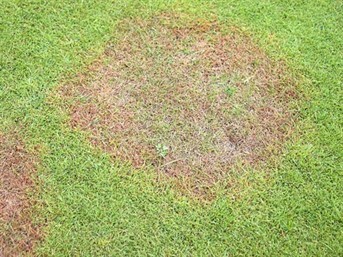 As the bentgrass dies resistant grass species or broad-leaved weeds invade the centre of the patch (Plate 2). Patches can measure from a few centimetres in diameter to over a metre. Symptoms may fade in late autumn and winter. Where is Take-All Patch found? In most cases, take-all patch affects newly established areas (especially on sand or USGA specification constructions or areas that have been sterilised prior to establishment). Some golf courses have problems with take-all patch year after year. This is usually associated with alkaline irrigation water or rootzones with high alkaline buffering capacity. When is Take-All Patch likely to attack turf? Symptoms are most common during summer months and tend to fade out during winter months. On greens, take-all patch can affect the playing quality as the patches become depressed affecting ball roll. As bentgrass is affected Poa annua grass ingress may occur in the space created. Avoid using lime to increase soil pH. Similarly, alkaline irrigation water or the application of alkaline topdressing may also encourage the pathogen. Installation of a water-acidifying unit may be considered to reduce the pH of very alkaline irrigation water. Using ammonium forms of nitrogen to fertilise, such as ammonium sulphate, are better for managing take-all rather than the nitrates. The application of manganese sulphate has been shown to reduce the severity of take-all patch. Thatch and poor drainage can increase the potential for take-all infections Therefore, minimising the thatch layer, ensuring good drainage and regular aeration are important in reducing the potential for take-all infection. Apply manganese sulphate in late spring before symptoms are observed. Trials have shown that optimum control of Take-All can be achieved by two applications in the spring, with a two week treatment interval, followed by two applications in the autumn. STRI trials have shown better spray penetration can be achieved by aerating the soil surface prior to application and tank-mixing with a good quality wetting agent. * Apply at a higher water volume when using conventional flat fan nozzles. High impact Syngenta Turf Soil Nozzles can target spray applications to reach soil pathgogens more effectively through dense turf and thatch layers with lower water volumes. Reduced water volume will increase sprayer output, enabling more timely application at the optimum time for disease control and reduce interuption to play. Apply iron sulphate in autumn months to help reduce the pH of the upper rootzone.